Elan Bearnais Pau-Lacq-Orthez (ProA) re-signed 27-year old Zimbabwean international power forward Vitalis Chikoko (208-91). He has played there for the last two seasons. 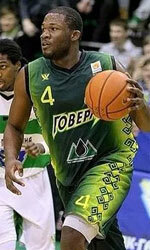 Chikoko has tried to make it to the NBA and played in the NBA Pro Summer League in 2013. Among other achievements his team made it to the German Bundesliga Semifinals in 2016. 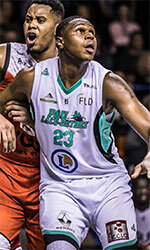 Chikoko received also Eurobasket.com All-French ProA Honorable Mention award in 2017. He represented Zimbabwe at the Afrobasket Championships in Rades (Tunisia) three years ago. His stats at that event were 5 games: 13.4ppg, Reb-4 (8.8rpg), 1.2apg, Blocks-1 (3.2bpg), FGP: 48.8%, 3PT: 20.0%, FT: 64.7%. Chikoko has played previously professionally in Italy (Grissin Bon RE and Tezenis Verona) and Germany (Gladiators, BG Goettingen, Bayern Muenchen and ASC 46 Goettingen). His game is described as: A talented, lanky forward/center who has a huge upside. Even stanging almost 6-10, he can spend yet time at the PF position, thanks to enormous athletic skills, versatility, and good feel for the game. His long arms allow him to be a good defender and shot blocker.